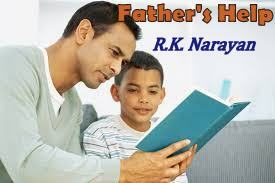 In the short story titled “Fathers Help” the famous Indian English writer R.K Narayan unravels the inner psyche of school going child. Through the fabrication of false stories regarding his teacher and his subsequent attempts to justify his ends by Swaminathan, the protagonist of the story hold the main theme. This short story highlights the need of understanding between parents and children, and the significance of ideal teacher pupil relationship. In the beginning of the story we find Swamy the protagonist of the story plays truant and lies his mother that he has headache. As he showed reluctance to go to school his mother asked him if he had any important lessons that day. In reply Swamy opined that the geography teacher had been teaching the same lesson for over a year now and arithmetic period meant for the whole period the students were going to be punished. His generous mother permitted him to stay at home. Though he could fool his mother, by the entry of his stubborn father, his fate took another turn. When he realised that he couldn't adjust the situation with his headache, he changed his tactics. He told his father that he would be punished by his teacher if he went late to school. To substantiate his argument, he gave a lurid account of falsehood regarding his teacher Samuel that he would beat children until he saw blood and made them smear it on their forehead like a vermillion marking. Hearing all this, his adamant father forced Swamy to school with a letter addressed the head master. On his way to school, Swamy felt that he was the worst perjurer on earth. Apart from the hearsays there was no knowledge of Samuel cruelties within his mind. To justify what has been written in the letter he wanted Samuel to do something. So that he decided to deliver the letter at the end of the day. When Swamy reached his class room, Samuel was teaching arithmetic. Beyond all his expectations, Samuel permitted him to enter the class. Thereafter, Swamy was deliberately provoking Samuel, whereas all his efforts were of no use. The arithmetic period came to an end. In the last period of the day, when Samuel came to teach Indian history Swamy played all hi tricks and his skills to the fullest possible extant to enrage Samuel . without being able to tolerate Swamy unwanted questions and yells, Samuel caned him. Being jubilant he rushed to the head master room, but found the room locked. When curiously asked about the head master the peon informed him that the head master would be on leave for a week, asked him to handover the letter to the assistant head master who was Samuel. Hearing this he fled from the place. As soon as he reached home, hearing Swamy excuses, father reproached him calling a coward. Father tore the letter in to pieces commenting you deserve your Samuel.